Like to rent a Laser any day of the week? Now you can. Northshore WaterSports will rent a Laser Radial for $10/hour to AYC members. Would you like to sail on Sunday afternoon on Tempe Town Lake but don’t have the right boat for the job? Well, adopt a boat! 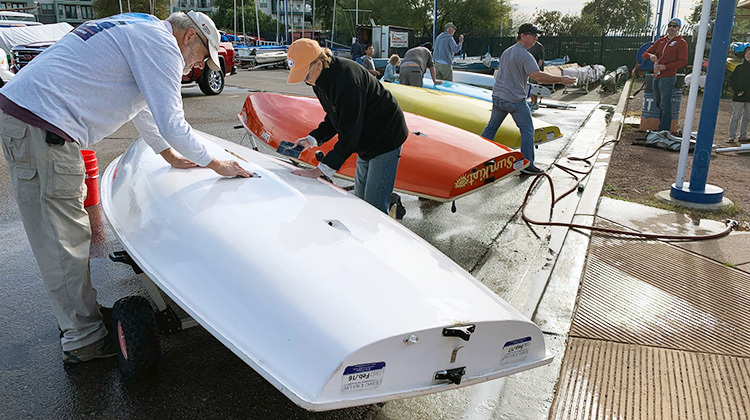 Members of the Arizona Yacht Club can adopt one of our Laser, C14 or O’pen Bic boats during the Sunday afternoon TTL racing and race committee training sessions. No charge. Just arrange for it in advance and enter the race series (you must sign up for the entire fall or spring series). You do not have to actually race, but we require that you enter the race series in order to be covered by our insurance. First, you need to be an AYC member. If you’re not a member yet, click here to join! And, of course, you need to know how to sail. If you don’t, we suggest an Arizona Sailing Foundation course. Contact Grant Younger, the Adopt-a-Boat coordinator, to discuss your skills and then complete the paperwork (linked below on this page), including signing up for the race series. Get to the lake to meet Grant (or someone he designates) 60 minutes before the start of racing (start times vary by season). That will give you time to turn in the documents and rig the boat. Here’s the legal stuff for the Arizona Yacht Club. It’s a variation on the Pottery Barn agreement: You break it, you fix it. Tempe Town Lake is operated by the City of Tempe, so as a result, they’d like you to know about the 12 pages of rules they have. To summarize: if your mother wouldn’t be embarrassed by what you do, you’re probably all right. Here’s the test we ask you to complete. Easy, right? Here’s where you register for the race series. Can I sail the boat sometime other than when there’s racing? No. 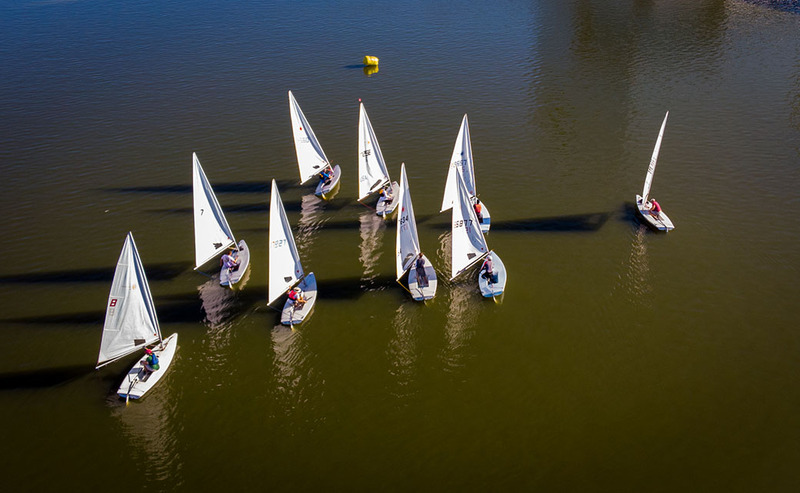 We realize you’d like to sail whenever you’d like, but by adopting a boat only during race days, you’ll be covered by the club insurance, we’ll have a safety boat ready to help if you get in trouble, and there will be other club members around to assist. For more time on the water, we suggest one of the ASF courses or the Northshore WaterSports Laser Radial rental option. We keep the boats in the marina, so they’re easy to rig and launch. Do I need a vehicle with a tow hitch? If you’re sailing a C14, be sure to bring a tow vehicle with 2-inch-ball hitch to launch the boat. C14s can not be launched by hand. Lasers can be launched by hand. Will there be people around to help me rig the boat? Yes, but please arrange for the help in advance. While there will be many AYC members around, they’ll be getting their own boats ready to launch and they usually won’t have spare time available to help you. Please do not ask someone to use their tow vehicle to launch your C14 since that’s very time-consuming. I don’t really want to race, just sail. That’s fine and we encourage it. If you’re comfortable in the boat, you may decide to race sometime in the future. You do need to enter the race series, but be sure to tell the race committee that you’re not competing. This is important because otherwise they may hold up the start of races waiting for you. You can notify them on land before you launch or sail past and tell them when you’re on the water (they’re by the flag pole). Any more resources I can tap before I head out? If you’ll actually be racing, here are some helpful explanations: Tempe Town Lake race procedures and some information about the C14 fleet and the Laser fleet and various tips for starts and racing fast.